Life, Magic of the islands of Feliran and Enas. It controls grass, algae, and even influences most bugs. Non-manipulation spells include healing, and rain-dances. Those affiliated with it suffer from less illness. And the last, yet first, element. Athaer, the fabric of Xaevos. It takes the aura of any being blessed by it and contorts in any way needed. It can even be used to create temporary weapons, or blast energy at a foe and create shields. Non-manipulation spells mostly include making magic circles to increase power or to heal anything in it. Athaer leaves it's mark, however. Objects tend to have a mirroring look to them, and living things glow a personal color. It should be noted that Athaer is extremely rare, and unlike the other elements, must be gifted to a mortal for them to use it. You can not learn it, and only a handful of people have any ability at any one time, much less a strong ability. Cities map by Sade. Please thank him, as the previous map sucked. The world is on the verge of a war. Kar'Nah'Kah, Zyka, and Cazenra forming and alliance against Exanos, Sanuki, and Feliran. The war hasn't began yet, but tensions are high. 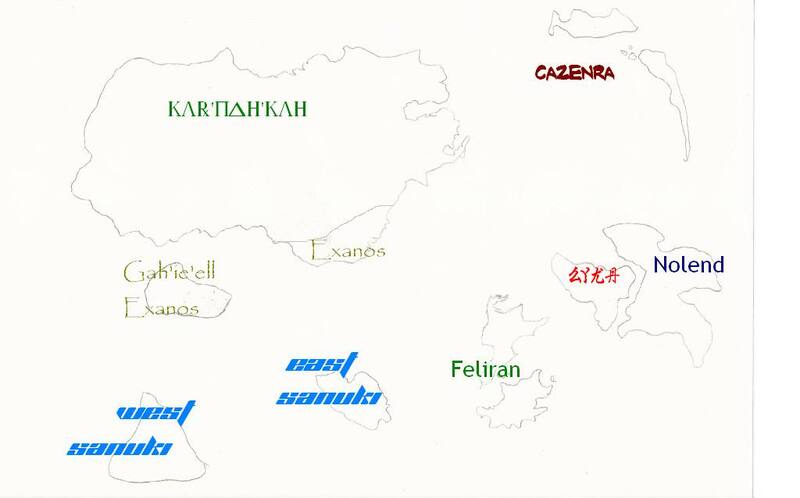 Currently, the main focus is between Zyka and Feliran, each threatening eachother more than all the other nations. Army's are being built, and militaristic tech is being invented. Congrats for everyone getting the work done!